Qatar’s won the right to host the 2022 World Cup finals.The small Middle Eastern country beat bids from Australia, the United States and 2004 World Cup co-hosts Japan and South Korea. 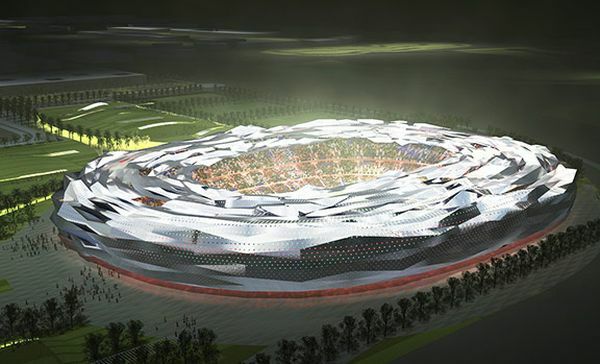 A Qatar-based engineering teacher has unveiled a design of an artificial cloud to shade and cool the open playgrounds to be used during the 2022 World Cup in Doha. When FIFA announced few months ago that Qatar will host the 2022 World Cup football tournament, experts slammed the world’s football governing body for choosing Qatar as the host because the climate of the Middle Eastern nation is too hot to play an energy-sapping game like football. The engineering department at Qatar University, headed by Dr. Saul Abdul Ghani, recently announced the addition of an artificial cloud-like shade for the stadium. The cloud is said to be made up of a hundred percent light carbonic materials and has four engines that run on solar power. It can also be positioned to hover anywhere over the stadium via a remote control. “Artificial cloud will move by remote control, made of 100 per cent light carbonic materials, fuelled by four solar-powered engines and it will fly high to protect direct and indirect sun rays to control temperatures at the open playgrounds,” he told the local Arabic media. Abdul Ghani said the initial model of the cloud cost $500,000 but the cost will decrease upon launching commercial models which could also be used at beaches and car parkings by using the mobile phone. Today, Saturday, April 30, 2011 I have been informed that Nikolaos Louridas, civil engineer 65. died in Qatar. It is not yet known when and where will be his funeral. His brother and his nephew already traveled to Qatar to carry his coffin in Greece. He attended the 6th Primary School of Athens Greece, at Street Dompoli & Trivonianou Street at Mets (Athens). After the 13th High School in Aghios Artemios and continued in the 7th High School in Pangrati (Athens). He was always an excellent student and lovable by all. He studied civil engineering at the Technical University (Athens). She worked on large construction sites with World known companies in Nigeria, Niger, Cameroon, Zanzibar, Jordan, Bulgaria, FYROM and finally Qatar, and had in mind to continue to work again in projects in Africa. Few people were so much educated as he having such emotional and spiritual level, love and tenderness for his fellow men as Nikos. His hom was a vast library, a temple of knowledge and culture, while he was always open to new ideas, without any trace of racial discrimination in any circumstances in which he faced throught his career which showed the mental superiority.He has been an example to all of us who will not ever forget him. He may rest in peace.